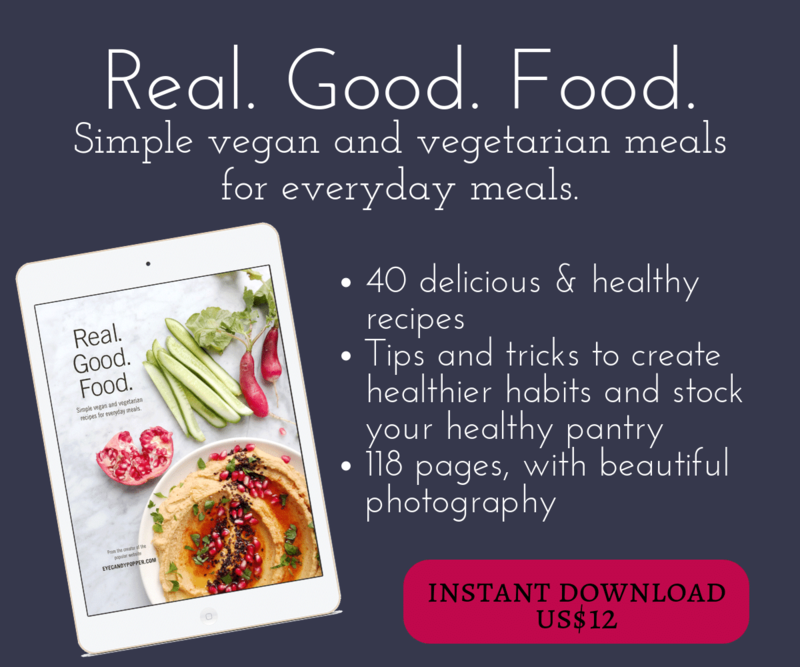 You’ve most likely heard of the movement of Meatless Monday? Well, there was also another movement called Wheatless Wednesday! It was created at the same time as Meatless Mondays, during WWI to encourage Americans to eat less meat and less wheat, to save for the army. Although we might not be living in war conditions now, I do think it’s a good idea to add variety to what we eat, and reduce meat and wheat. There are so many different grains and flours available out there, you too can open up this whole new world of possibilities in your baking. Don’t be afraid, most flours are easily switched without difficulty in small batches. 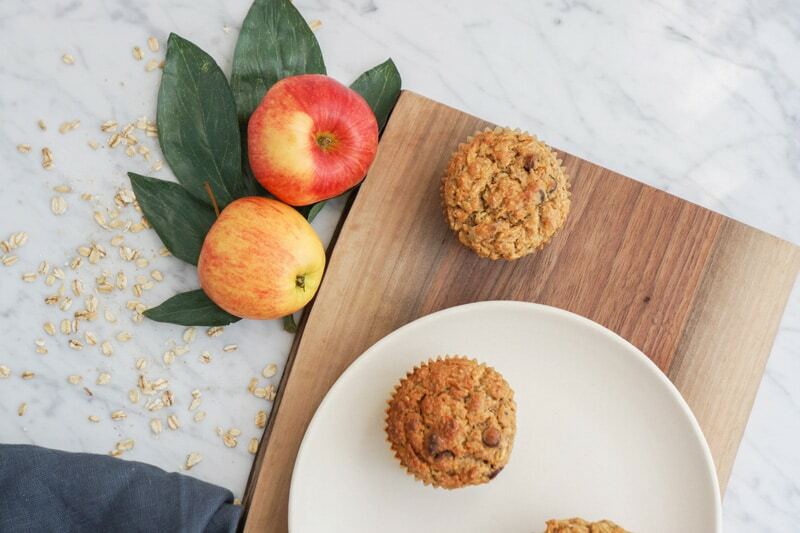 Here’s a delicious recipe for Oat, apple and almond butter muffins, made with spelt and chickpea flours. 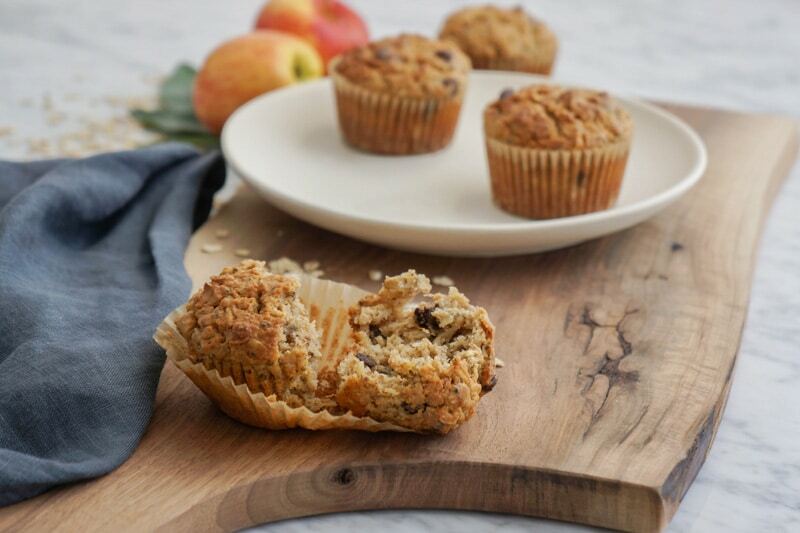 So, to start, some delicious healthy wheat-free muffins! 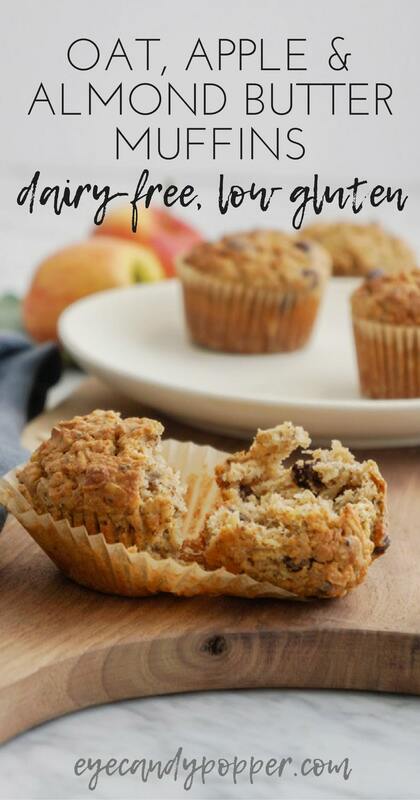 For more wheat-free healthy muffin inspiration, check out my Multigrain Banana Chocolate Chip Muffins, or these dairy-free Cranberry, Orange and Chocolate Chip Muffins. 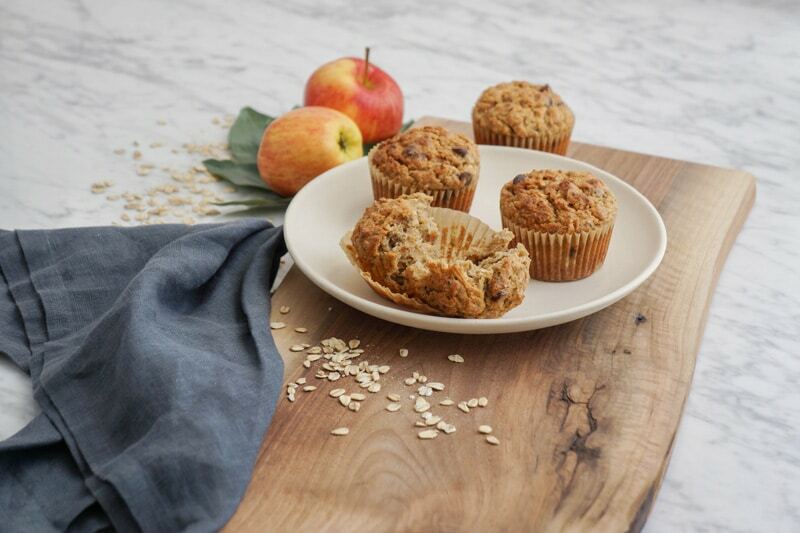 A better-for-you muffins made with wholegrain flours and low sugar. Preheat oven to 375F, line the muffin pan with 9 paper liners. In a medium-size bowl, mix the flours, salt, baking powder and chia seeds with a whisk, add the oat flakes and mix. In a large bowl, mix the eggs with the maple syrup with a large whisk, until well mixed. Add the almond butter, olive oil and vanilla, mix, add the grated apples and mix well. Add the wet mix to the dry one and mix, then add the chocolate chips. Divide the batter in the 9 muffin tins. Bake at 375F for 30-35 minutes or until golden. Remove the muffins from the oven and let cool down for a few minutes, then even though it’ll smell amazing and you’ll want to eat one right away, remove them and let cool down a few more minutes on a cooling rack. Looks delicious and great for breakfast! 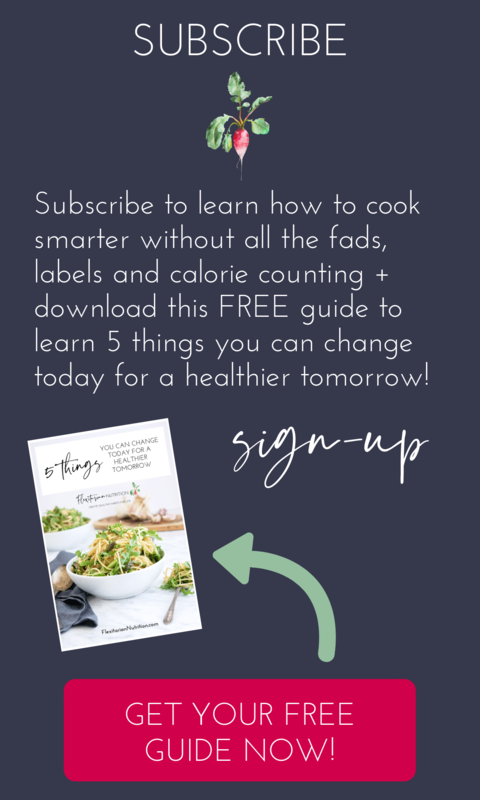 Love ‘your’ Wheatless Wednesdays idea, too … that’s amazing that it was started so long ago! I was shocked to learn about it too! Dear ECP, I live in Uruguay and there is no spelt flour. What other flour could I use to substitute it in your recipes? 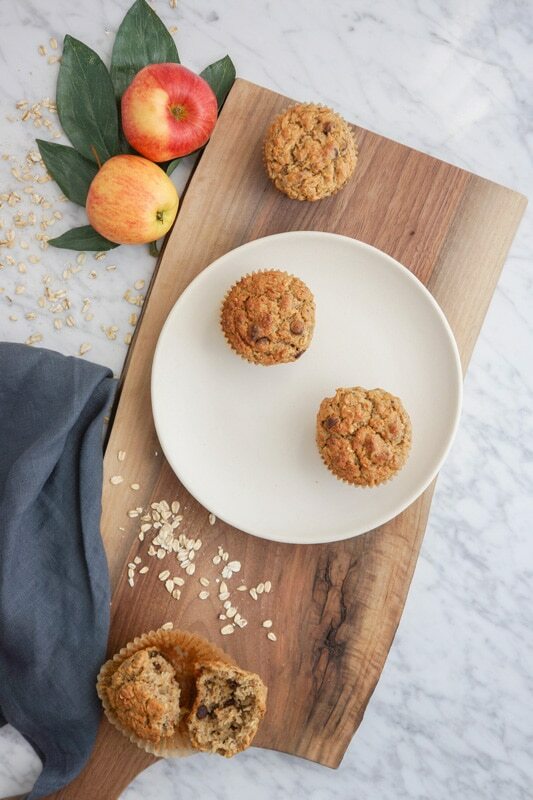 Love the idea of grating the apples in these muffins! Looking forward to trying this recipe! Definitely give it a try! The freshly grated apple add a delicate taste and moisture that is very different from applesauce. 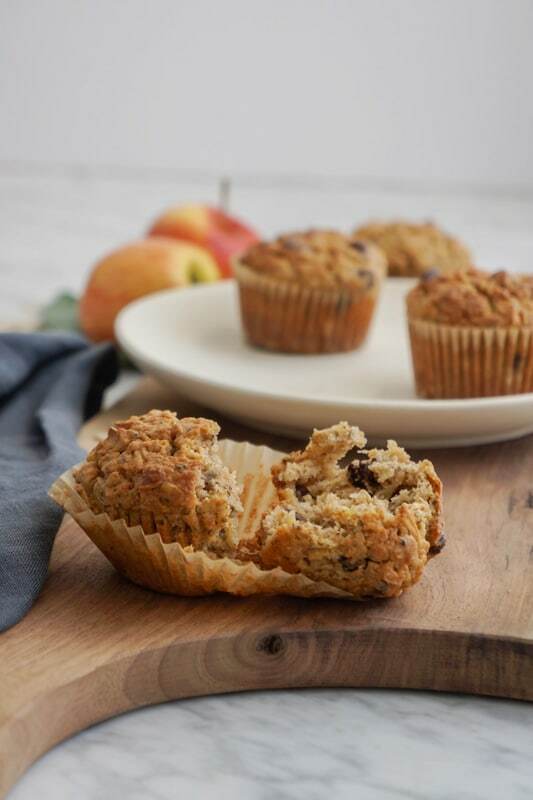 It has been one of my favourite discoveries in making muffins! And the aroma that you get when you mix the apples, vanilla and almond butter is ridiculous, makes you want to drink it right then and there! haha Happy baking! 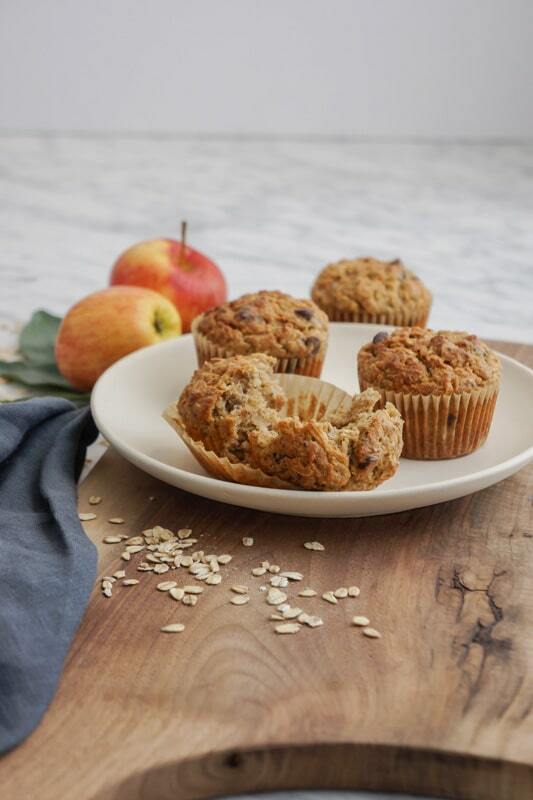 It’s a nice way to try other grains than wheat, and it tastes delicious too! The almond butter is everything in there!